After the delightful Santa Barbara Festival, folks began to wonder how does one continue to top such great efforts? 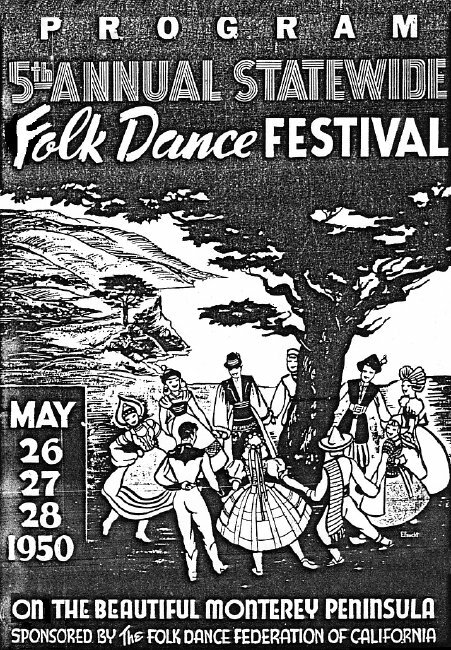 But Chuck Reed and Ace Smith were certain they could, so on behalf of the Folk Dance Federation, North, they were awarded the 5th Annual Statewide Festival to be held on the beautiful Monterey Peninsula in 1950. Being the North's turn to host, Statewide '50 was the subject of much discussion at a Festival Business meeting several months prior to the actual event. Danny McDonald was the new president. During the course of the meeting, the financial problems of our "Let's Dance" publication was of much concern. Folk dance clubs were springing up and joining the Federation almost daily but the cost of publishing "Let's Dance" was a terrific drain on the treasury. Someone suggested "Let's print the dance program in 'Let's Dance,' produce an extra thousand copies, and sell them at the Festival." Great idea, most agreed, and why just one thousand; let's print five thousand! Agreed and so ordered and then the subject was dropped. No plans for distribution were made so at Festival time, boxes of "Let's Dance" magazines arrived at Monterey and there they sat. No one seemed to know what to do with them. While not his responsibility, Dave Boyce contacted some local Boy Scouts and they agreed to sell them in the stands Saturday night. Their success was minimal as the lighting, while adequate for the dancers down on the field, was practically non-existant in the stands. You don't buy what you can't read and only 500 copies were sold the entire week end. This left the Federation stuck for the cost of printing 5,000 copies plus a royalty to the Editor of "Let's Dance," who received a stipulated amount for each copy printed, not just for those actually sold. It was several years later and a couple of new presidents, before the finances of the Federation got out of the hole as a result of this and other items of bad judgement. As to the Festival itsef, Ace and Chuck were right. They did put on a great show with a lovely little program, complete in every detail. The Friday night party was held at the spacious Fort Ord Soldier's Club and was very well attended for an Opening Party. The following Saturday afternoon, a joint North-South Teacher's Institute was held in the High School Gym. It was a huge success from the standpoint of attendance. It looked like everyone who attended the Festival tried to get in to that modest sized hall. We were stacked to the ceiling with dancers, or more like sardines in a can, but we were young and carefree and made the best of it with minimal complaints. We did learn two very popular dances; the "Sweetheart Ländler" and "Markländer." Saturday night we moved to the Monterey High School Stadium where we danced on grass under the stadium lights. The crowd was large and the stands were full of spectators who came as a result of the fine publicity. Harold Comstock, president of the South and the one and only Danny McDonald, his counterpart in the North, were introduced and made short speeches that were well received. It was dancing on the grass again, Sunday afternoon, at the High School Stadium with a full complement of dancers and the stands full of spectators. I was given the honor of chairing the Sunday program and was ably assisted by Dave Boyce. We ran into some trouble with equipment, burning out one turntable but fortunately had another on standby so there was no apparent delay. Dancing on the grass can be a bit tiring but with the enthusiasm for folk dancing at that time, no one complained even when doing the "Hambo." Thank you Chuck and Ace for a great time. The program cover was designed by Bob and Eleanor Elsocht.